with Victor Waddington Galleries, Dublin. Lavery's rediscovery of his Irish roots began in the early years of the century when he was asked to contribute to Hugh Lane's Irish Painters exhibition at the Guildhall Art Gallery in London. His interest in Irish affairs accelerated after his marriage to the Irish-American, Hazel Martyn in 1909. In 1913, the Laverys made a tour of the southern Ireland, on which the painter produced a small group of holiday sketches, one of which The Madonna of the Lakes, the Lakes of Killarney, (untraced) formed the background for his large triptych, The Madonna of the Lakes, painted in 1917 for St Patrick's Cathedral in Belfast. During the 'Black and Tans' years, these contacts continued, with the Laverys using their influence, and acting as conduits in the Treaty negotiations of 1921. Because of Hazel's role in this, the Laverys were fêted in Dublin in the twenties, although due to the continued factionalism, they were not universally admired. In 1924 they decided to repeat the pre-war tour and travelled to Kerry, via Glendalough and Tramore. On this occasion Lavery painted a number of landscapes of the lakes and a splendid study of an old peasant astride his donkey, which he entitled The Kingdom of Kerry (private collection). The present landscape dates from this tour. The lake of Killarney and the coast of Kerry had been appreciated for their picturesque beauty since the mid-eighteenth century when the Lord Viscount Kenmare built a mansion there. His latter day descendants, London socialites, the Castlerosses, were friends of the Laverys. 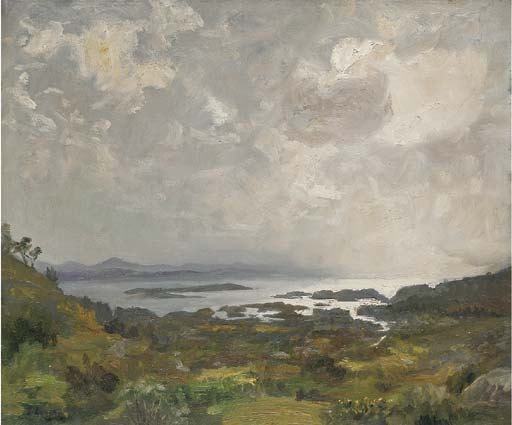 The Laverys stayed at Kenmare House during their visit and, as was his habit, the painter produced a number of landscapes of its splendid garden. Lavery's panoramic views of the lake and mountains of the Kenmare estate, revisit sights which were first painted by Jonathan Fisher in 1769. Thereafter the area became popular with 'picturesque' tourists. As befits a work of the eighteenth century, Fisher's panorama in its topographic detail has little in common with The Coast of Kerry, a rapid oil sketch of the twentieth - save perhaps in one important respect. The palette of the two pictures is remarkably similar. The lush greens, so consistent a feature of the rich farmland of the Pale, have given way to dull browns in the Kerry landscape, and the unique moody atmosphere of the locality was as clear to Lavery as it had been to Fisher, over a hundred and fifty years earlier.